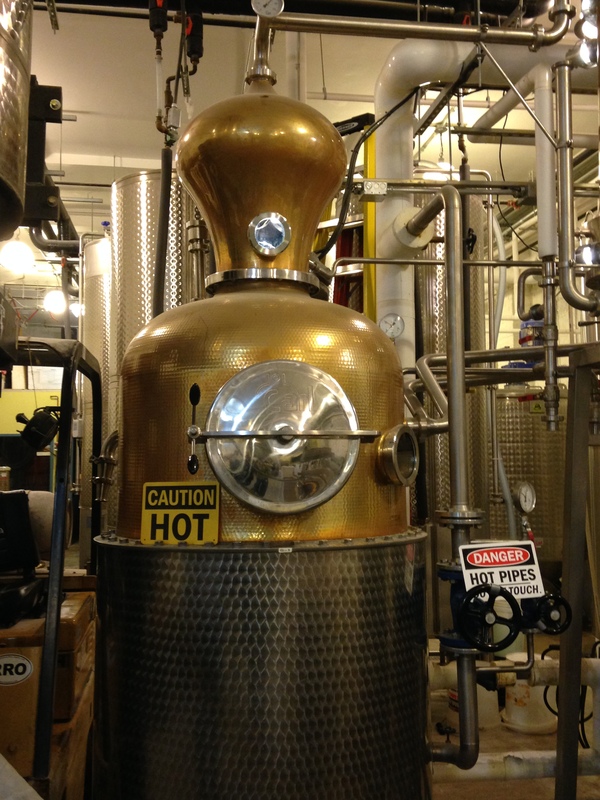 Microbreweries are expanding/exploding but now so is something else…microdistilleries. What is the world coming to? HEAVEN! 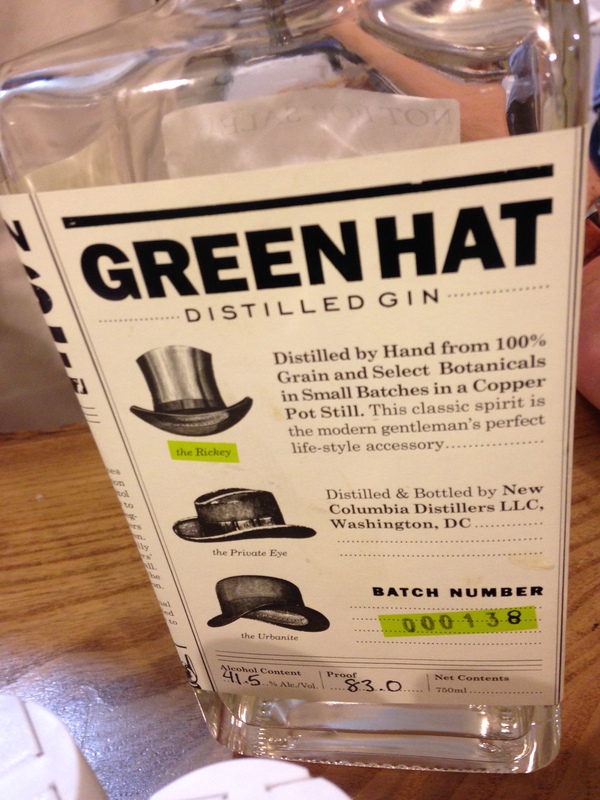 In DC there is a gin distillery, Green Hat (they hope to make more than gin in the long run). They have been around for a little over 3 years now and are located in NE (the North East quadrant if you’re not completely familiar with the area). It’s one of the less expensive areas so this is of course where a lot of the growing micro (alcohol) folks in DC are going because of the cost. It’s amazing, there is so much potential and it’s really helping these areas grow. It’s also where Union Market (drove near it since the street sign isn’t actually on noted off of NY Ave so took a couple extra turn and my GPS was taking me some extra places). Ok, anyway, back to in. 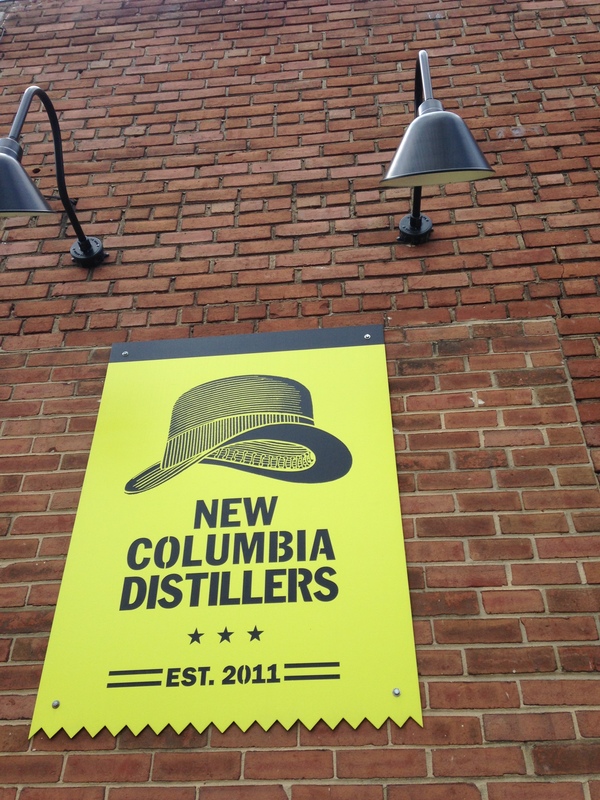 So to actually visit the distillery you can only go on Saturdays from 1-4pm. 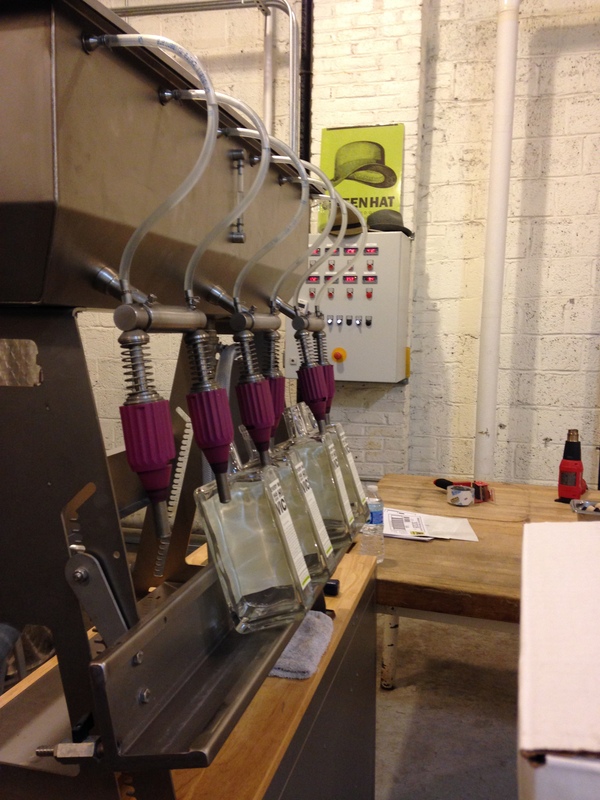 The rest of the week they are busy making this good gin for us. 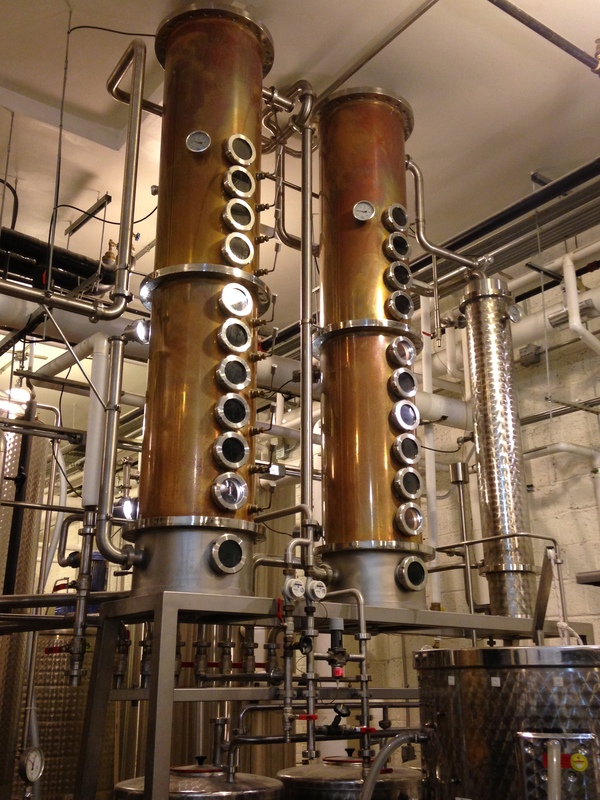 You go in and get to taste a couple gins and get a tour of the place. 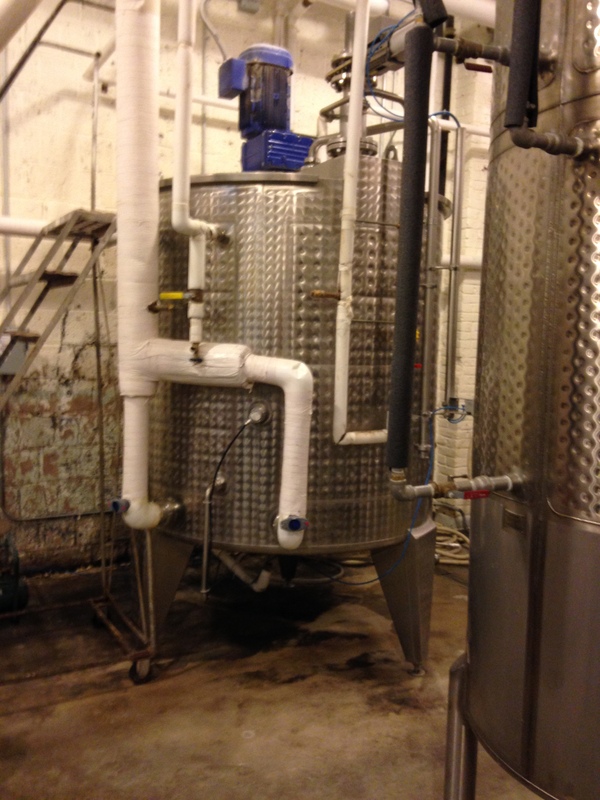 What was great on the tour is that you walk to the back of the distillery (maybe the width of a football field) and the guide said ‘ok, this is the whole size of the place, nothing more, are you disappointed that more of your tours are so much bigger?’ This ‘tour’ was very interesting because I’ve only done beer and wine tours so I learned the process of distilling gin. They have gone through a long process of who to work with for getting their product and are working with relatively local farmers in Virginia. Then we learned about everything from start to finish, from grains going in, to heating to the ‘flavor’ choice going in to bottles. The whole process can take about a month. With the tour you of course get a taste. 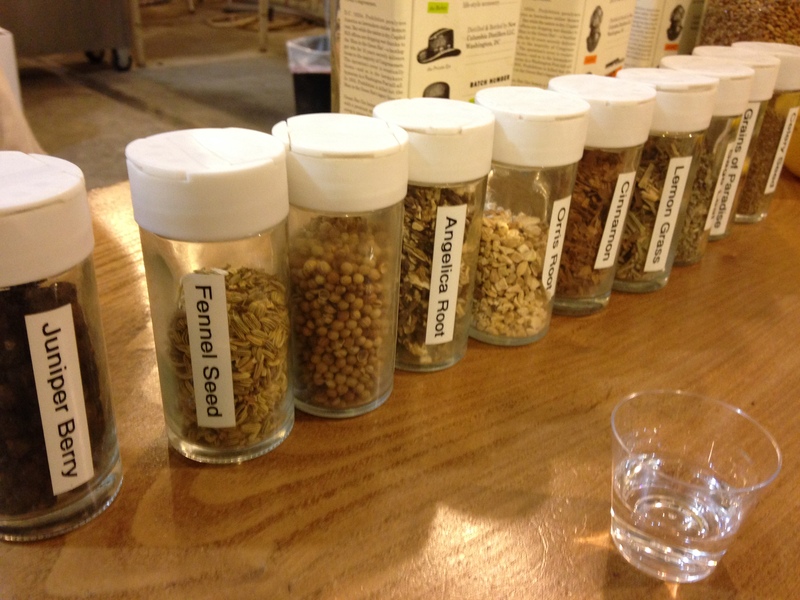 They consider a variety of spices when making the gin, from juniper berries to celery seeds, so have these out for you to smell why enjoying the gin. The first gin we tasted was their tradition gin. This one was about 41% alcohol. They hand write the percentage and proof on each bottle in case anything changes and anybody comes in to inspect them. The second tasting was the Navy Strength which was around 57% alcohol. WOW! I think I was shivering when I sipped that stuff. 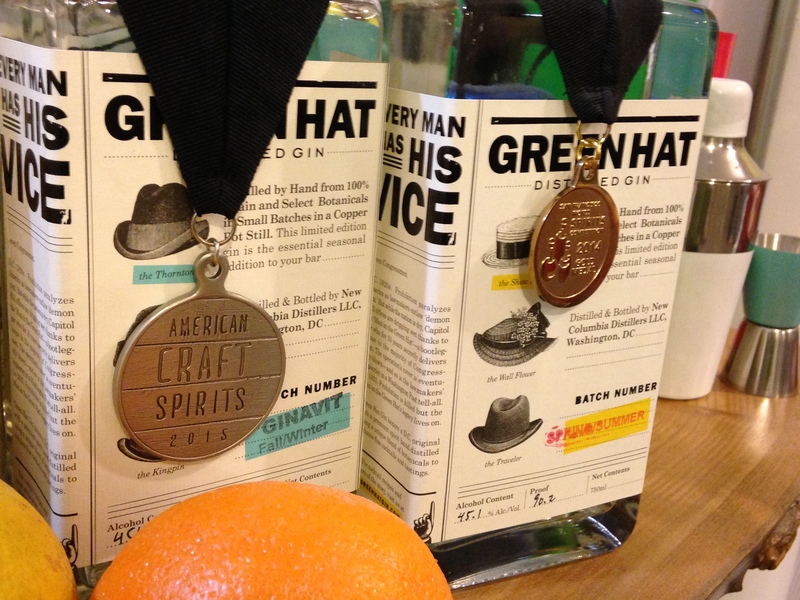 Though we didn’t get to taste them, they received awards for two of their gins last year — Ginavit and Spring-Summer. Side note — I though we were tasting all 4 of the gins, so I was carefully sipping the first 2. 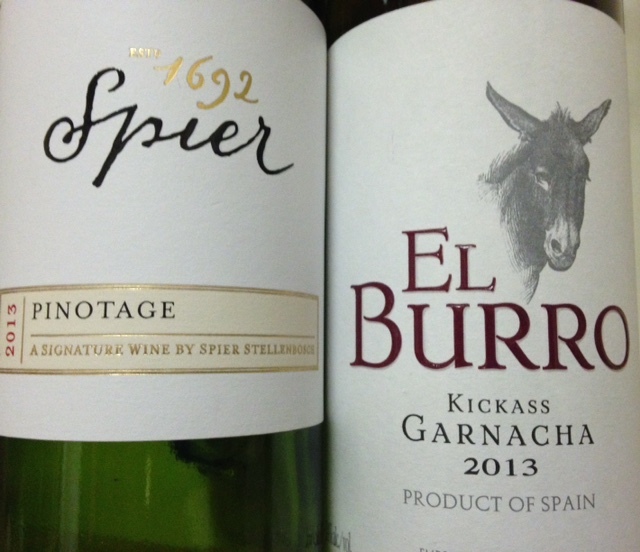 Not that I needed to down them, but still, I wanted to taste the awards winners. 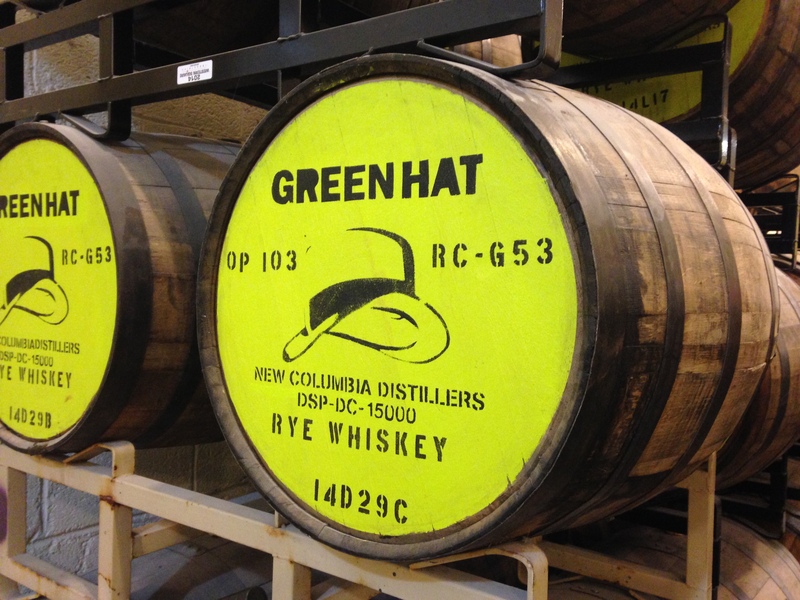 They are also working in whiskey. They hope to have this ready in about 3 years. So, if you live in DC, head to NE on a Saturday afternoon and check this out. Go to Union Market after it and get some food, or there is a MOMs 3 blocks away. This area is growing and it’s great. Cheers. Caught up with a friend the other night and we were in the mood for some good margaritas. There are always the cookie cutter places. Why we must we always go there? 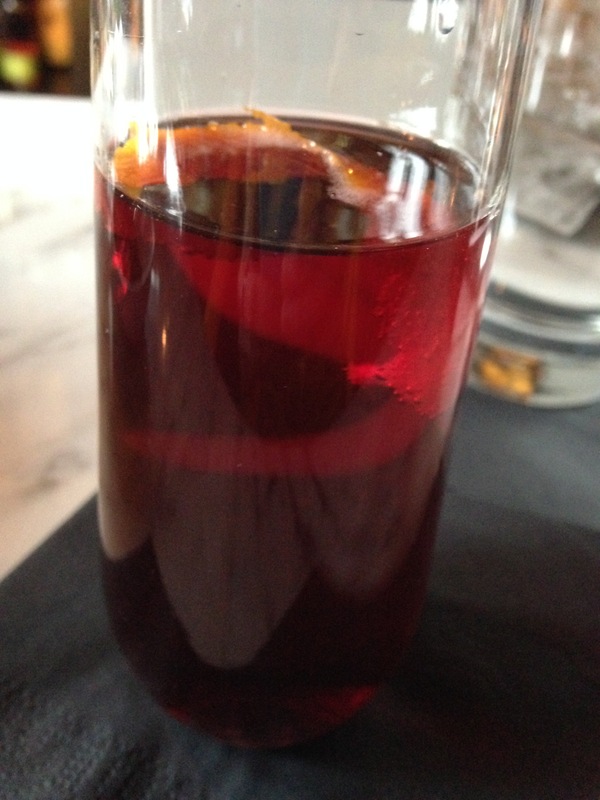 Then I remember checking out a place in Woodmont Triangle (in downtown Bethesda) last year that I wanted to go to again. It is so ‘hidden’ that it’s easy to miss. We eventually tracked down Gringos and Mariachis on Cordell Ave. I say hidden because there is no sign for it. The exterior of the building is gray and their name is painted in black above the windows. If you don’t know exactly where it is, amongst other popular restaurants, you walk right by it, as we did. I only worked and lived near it for years and missed it. Anyway, we walked in and it was packed on a Friday evening. We snagged a (1) stool at the bar and (fast forwarding) were eventually able to get another. They had a good variety of margaritas and I opted for the smoked one to begin. 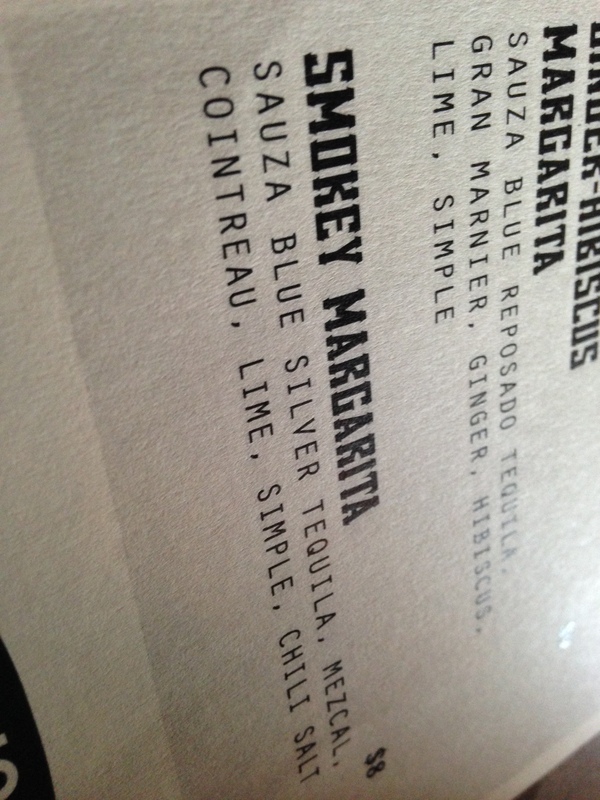 The bartender said it’s the combo of the type of tequila and mezcal, and of course the special salt blend they use that makes it good. Very unique and darn tasty! We also got some staple food, from chips and guac to salsa. Some of their salsa is super spicy! They have tacos al pastor, which are very hard to find in the US. I remember having them in Mexico. It’s a pork taco and very good. 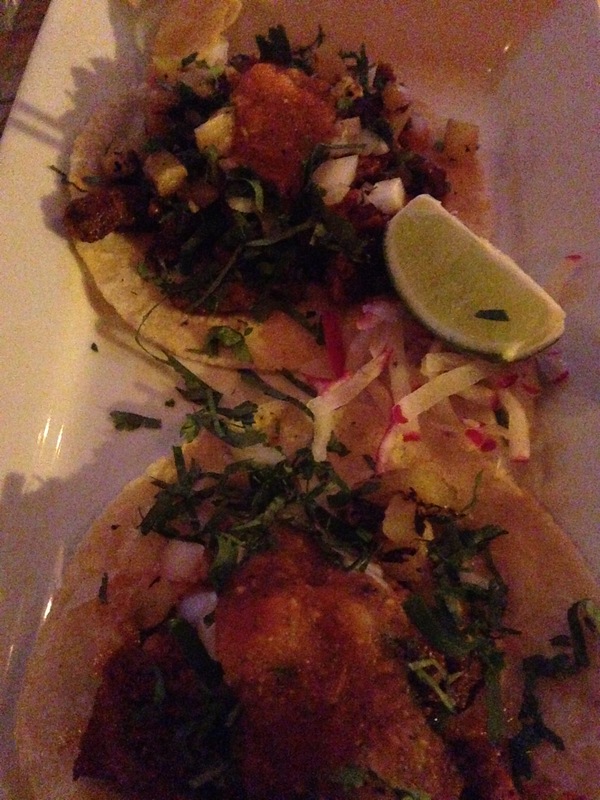 We also had their delicious seafood taco with Mahi Mahi. 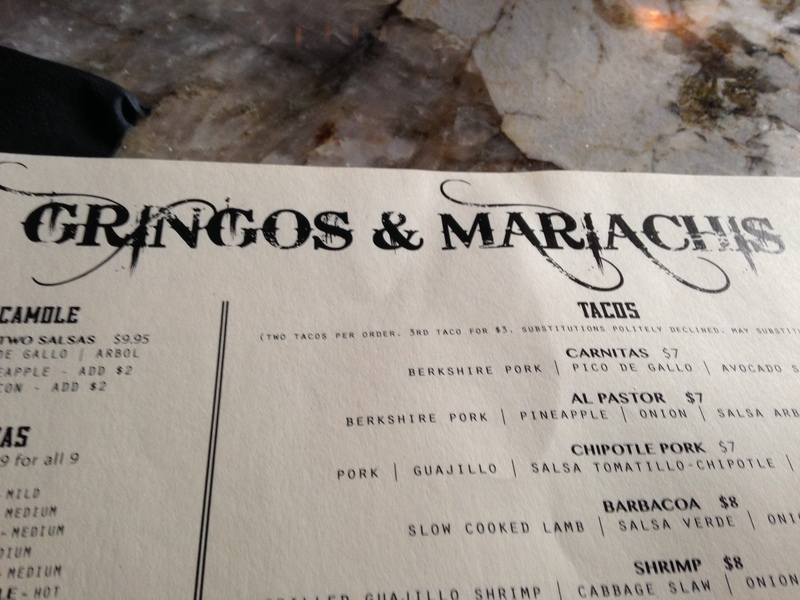 Another great restaurant to check out, especially if you’re into margaritas. And, it’s close to the Bethesda Metro and near many of the parking garages. Checked out a new restaurant in one of DC’s growing neighborhood’s recently. 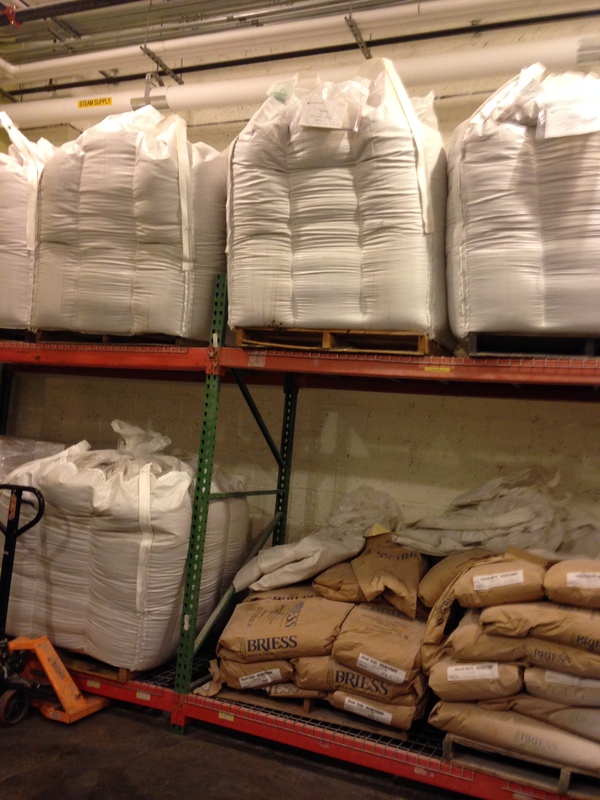 Visited DC Harvest on H Street. While walking to the restaurant from Union Station one thing I noticed was the ‘Coming Soon’ signs for the trolley. Can’t wait to see when that actually happens. Could be years away. Anyway, the restaurant is fairly new — opened in November of 2014. 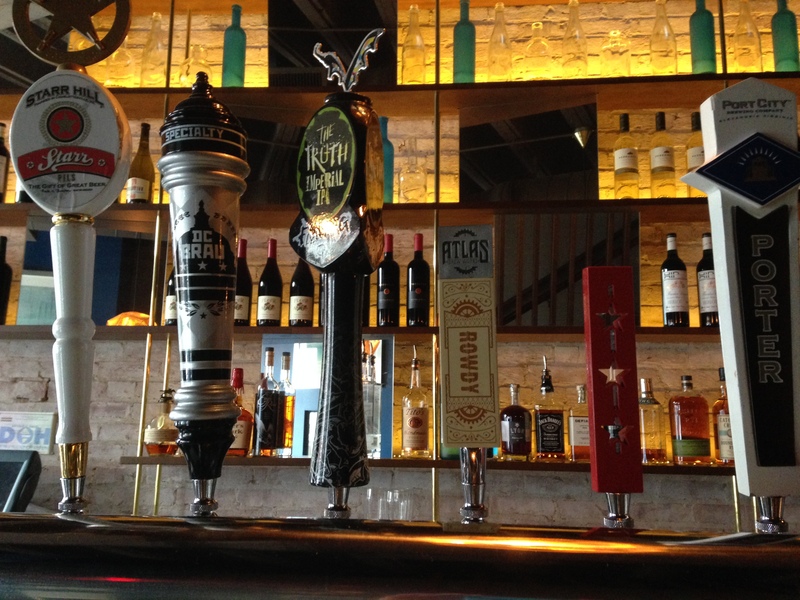 They have a great bar right near the door with a variety of taps and variety of drinks on the menu. 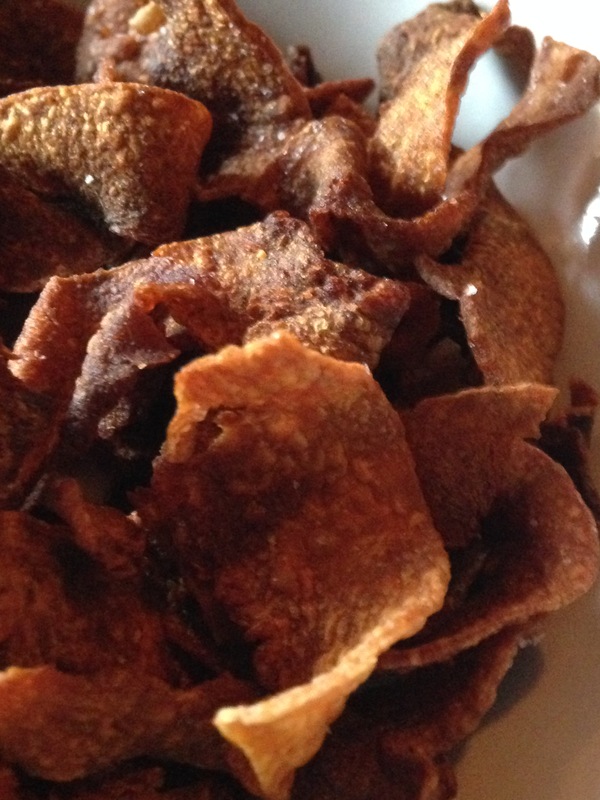 They also give you these additive sweet potatoes chips to nibble on as soon as you sit down. Though the taps were all appealing I opted for one of their concoctions, the Betty White, which has a nice raspberry and bubbly touch. Eventually sat down for dinner and they had great options from moutwatering salad to seafood dishes. 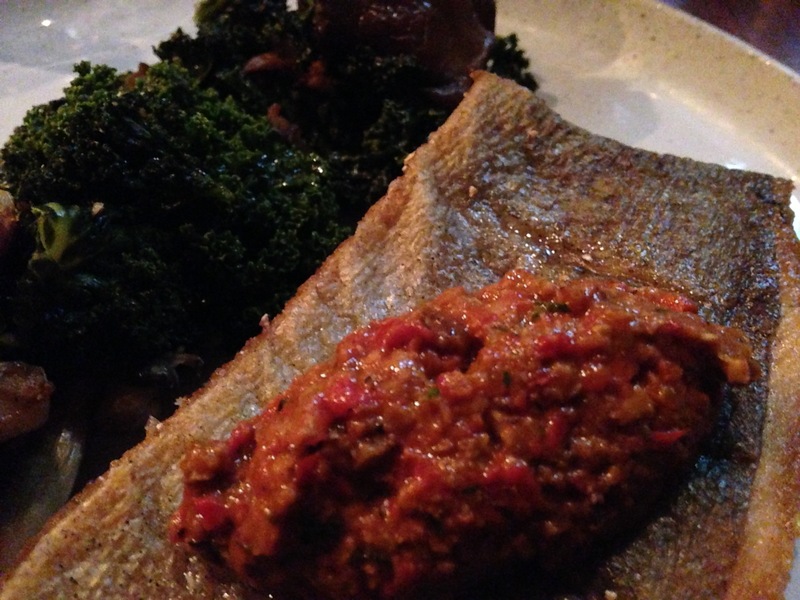 I opted for the trout, which was served with kale and mushrooms. They change the menu seasonally so you get a nice variety. This was absolutely delicious! Would definitely recommend checking this place out if live in DC or are visiting. Easy walk from Union station or a quick cab ride. So, after making the salad a couple weeks ago with turnips, and being quite happy with the taste of those root veggies I hadn’t tasted for ages, had to give them another try – T2, . Also, since I had purchased two of them I also don’t like food to go to waste. I googled some recipes to see what I could find and nothing overly exciting was coming up so I basically just decided to roast them and make ‘home fries’ — aka the same as what you’d do with potatoes. 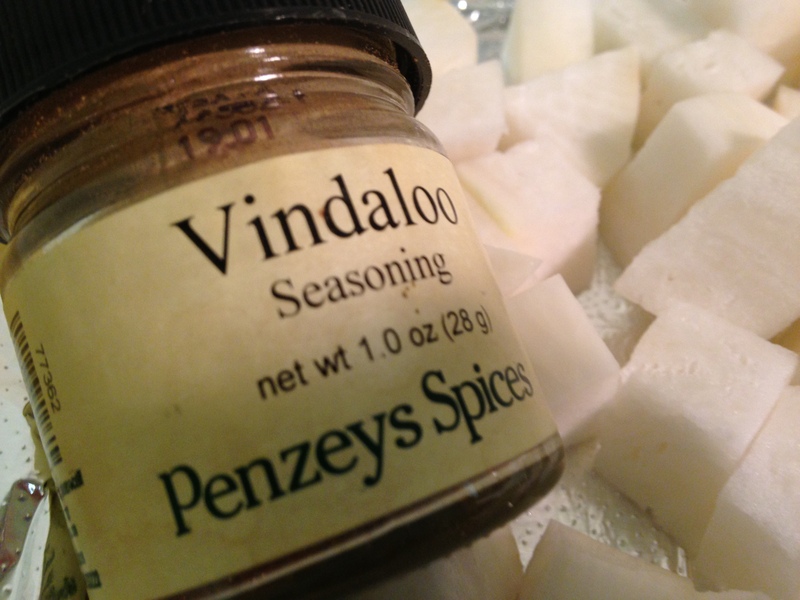 I cubed them and threw some delicious Penzey’s spices on there. Put them in the oven at about 400 for 20-30 minutes. I checked them after 20 and decided they needed more time. They looked good after 30. Tasted them and you know what, they really just weren’t that exciting. Sort of mushy (?). Maybe I overcooked them? Maybe their flavor had been nicely hidden when I enjoyed them in the (crispy) salad a couple weeks ago. Oh well, I tried them so that’s all I needed to do. At least the turnip didn’t go to waste. 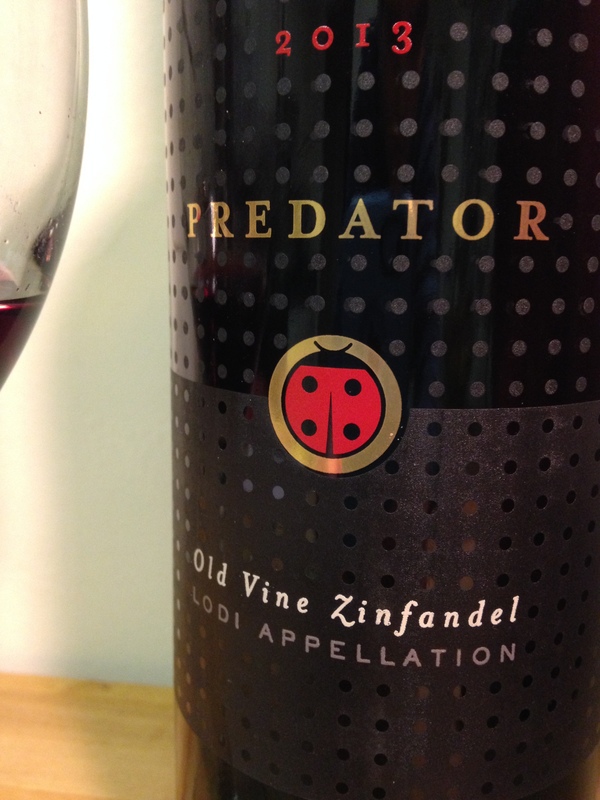 Came across a new (Old Vine) Zinfandel last week that is wonderful. It’s Predator in Lodi, CA. It has some nice fruit, I tasted mostly cherries, then the other taste(s) I found was leather. There was something else that I just couldn’t place. Was also thick/chewy, but not overwhelming. Great wine, and I found it in the DC-area for about $12 (at Total Wine). Totally recommend checking it out if you’re looking for something new. Am still on a roll to make new recipes, must expand versus stay in a rut. Saw another one that caught my eye in the most recent issue of Bon Appetit (March 2015) — Cauliflower-Cashew Soup with Crispy Buckwheat. In addition to it sounding good, I had to figure out what the heck buckwheat groats are. So, of course this was another reason to go to the great bulk section of Whole Foods. It is almost problematic that I live 1/2 mile from one of the aforementioned grocery stores. I miss living the close to a Trader Joe’s except when I need such things are buckwheat groats. ¾ cup plus 2 Tbsp. cashews — go Trader Joe’s! 6 cups (or more) vegetable stock, preferably homemade — TJ’s is the best place for (just) the broth! Heat ¼ cup oil in a large heavy pot over medium. Add shallots, garlic, bay leaves, and thyme; season with salt. Cook, stirring occasionally, until shallots are translucent, 6–8 minutes. *Quick note — thyme is green. Add wine, bring to a boil, and cook until reduced by half, about 4 minutes. 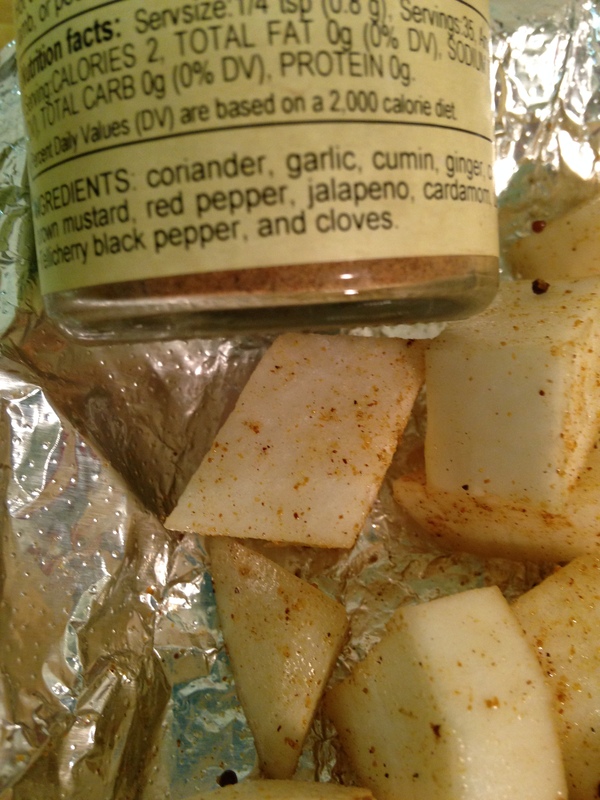 Set ¾ cup cauliflower aside; add the rest to pot along with cayenne and ¾ cup cashews; season with salt. Cover pot, reduce heat to low, and cook, shaking pot occasionally, until cauliflower is fork-tender and vegetables have released all their water, 20–25 minutes (check occasionally to make sure vegetables are not browning; reduce heat if they are). Add stock and season with salt and black pepper. Bring to a boil, reduce heat, and simmer, partially covered, until cauliflower is falling apart, 20–25 minutes. Discard bay leaves. Remove from heat and let cool slightly. *In addition to thyme being green, as I was pouring the veggie broth into the pot (they do use stock), I was thinking about the picture they have in the magazine (follow the link to the recipe) and how it’s bright white. I have brown-ish broth. How is this going to brighten up? Meanwhile, finely chop reserved ¾ cup cauliflower and remaining 2 Tbsp. cashews. Heat remaining ¼ cup oil in a small skillet over medium. 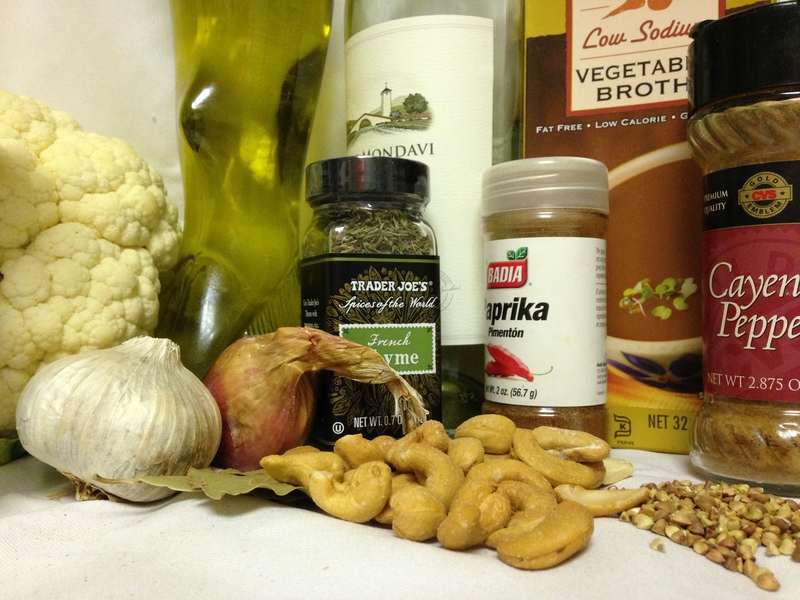 Add cauliflower, cashews, and buckwheat; season with salt. Cook, stirring often, until cauliflower and cashews are golden brown and buckwheat is browned and crisp, 5–8 minutes. 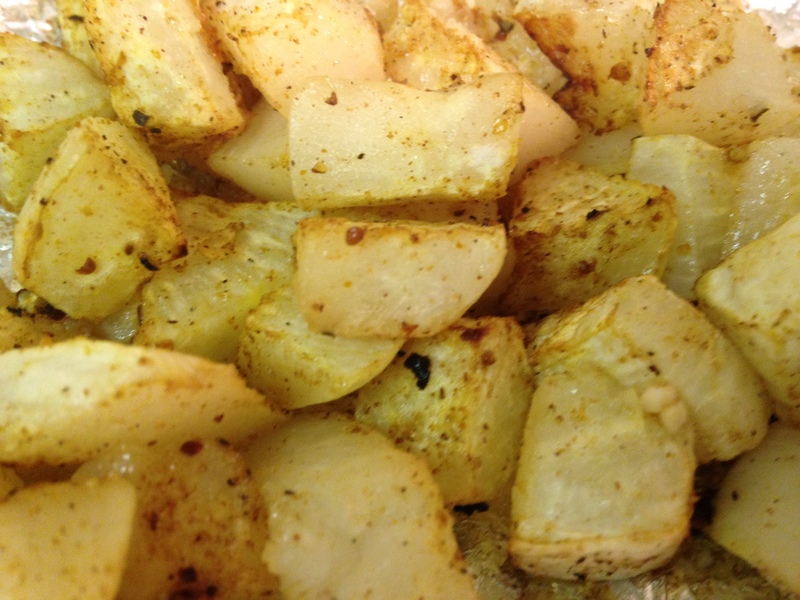 Remove from heat and stir in lemon juice and paprika. Let cool slightly. 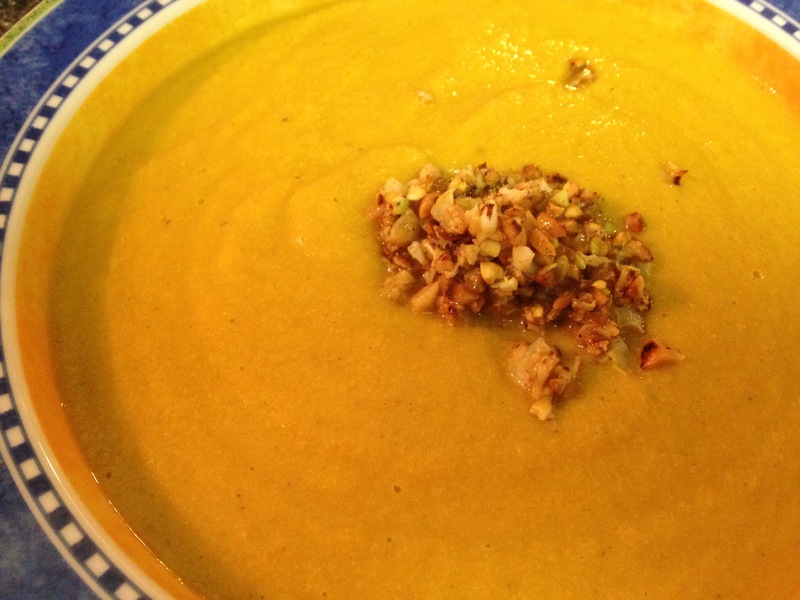 Working in batches if needed, purée soup in a blender until very smooth — can we say immersion blender??? Return to pot and reheat over medium-low, stirring and adding more stock to thin if needed (soup should be the consistency of heavy cream). Taste and season soup again if needed. Serve soup topped with toasted cauliflower-buckwheat mixture. End result, very tasty, orange-ish (not white) soup — totally check out their link for comparison. Was nice and thick, just like they called for. Very unique flavor and definitely worth making! I attempt to try food I ‘don’t like’ at least once a year. But the other day I came across a recipe with something I just sort of dismiss because you don’t have the easy attempt or common offer to eat it, it’s not many people’s favorite and it’s not staring at you in the grocery store — turnip(s). So, when I was having a couple friends over for dinner the other night and preparing a veggie meal, this was a great time for me to give these guys a try. The recipe I opted for is from Bon Appetit’s January issue — Crunchy Turnip, Apple, and Brussels Sprout Slaw. Well, since this is from the January issue, the main ingredient is not in (high) season right now. Luckily Whole Foods had it (this was after a couple other stops when I was debating changing my menu). 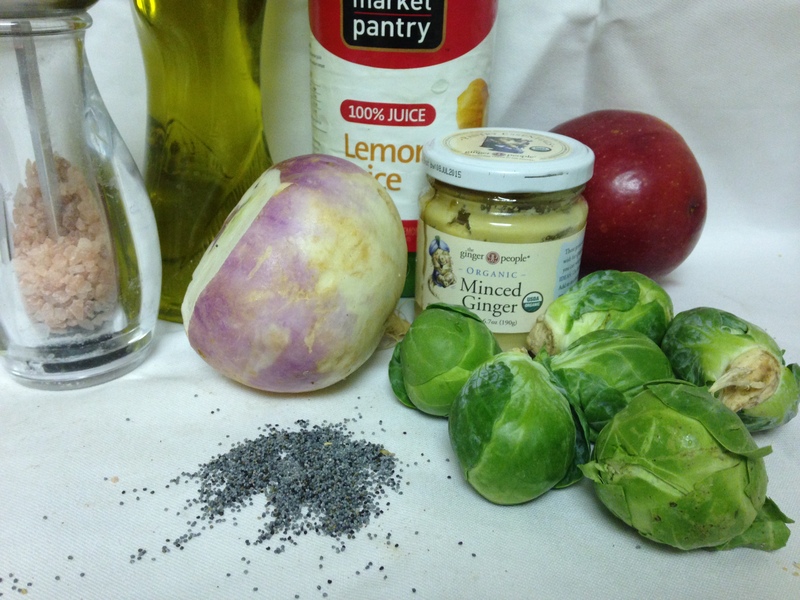 1 teaspoon poppy seeds, plus more — gotta love Whole Foods bulk section! 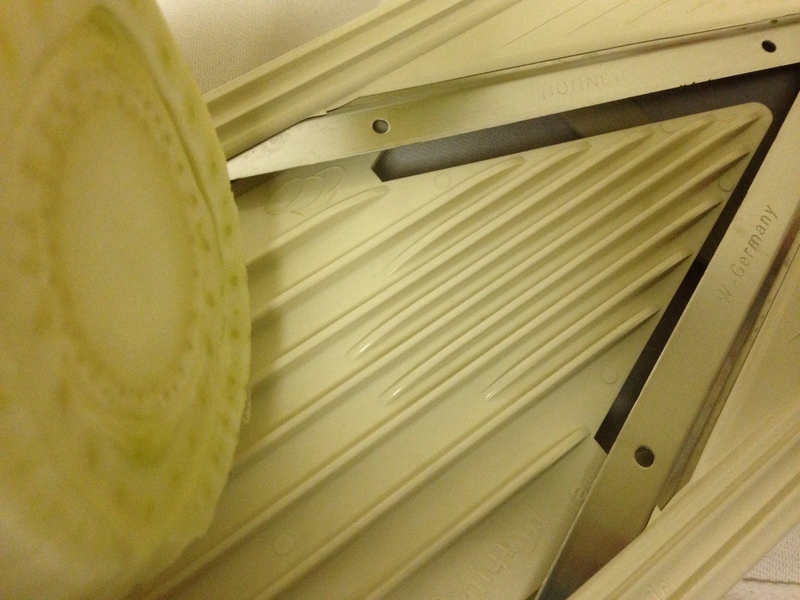 For the turnips and apple, I went to town with the V-slicer, with the attachment to make those beautiful matchsticks. Oh I love the kitchen! Add turnips, apple, brussels sprouts, and 1 tsp. poppy seeds and toss to coat. 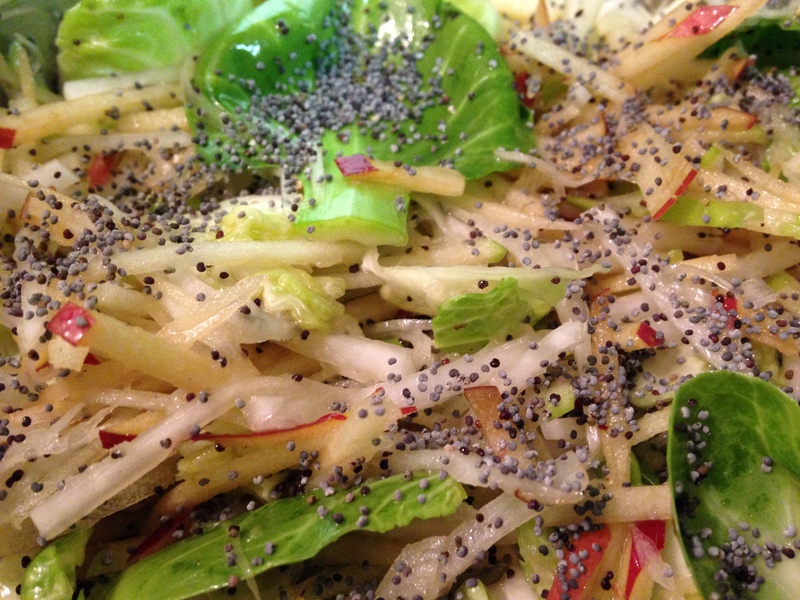 Serve slaw topped with more poppy seeds. Quite the salad. There was such a nice crunch to all of it, and the dressing was delicious. I love that since the key ingredients were in matchsticks they weren’t overwhelming. I ate turnips again!!! Had I not known there was turnip in there, wouldn’t have been able to tell you. Could almost have been jicama. One thing I’m surprised about is that this is published in the January issue since it’s a no-cook, cold salad. 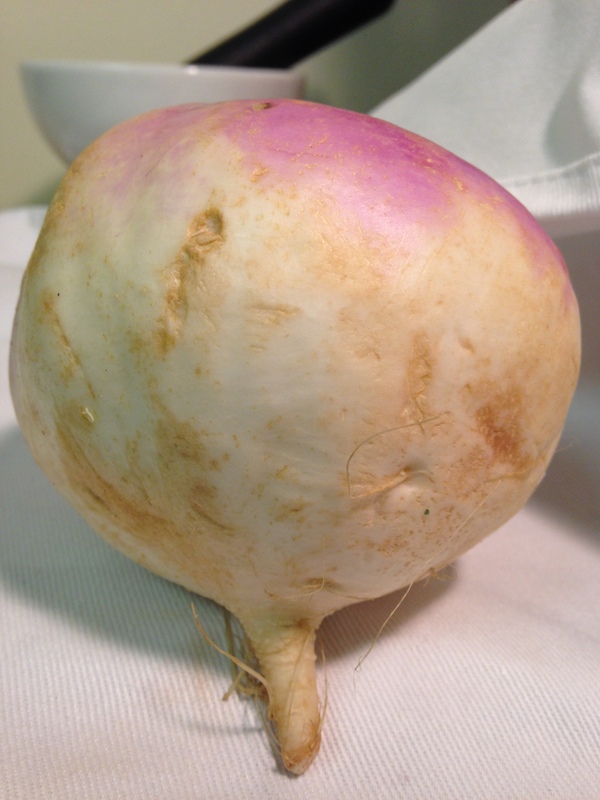 The only thing I could think is on the turnip being more of a winter root veggie. Thoughts? I will definitely save this for summer. Got around to making a recipe from my pile of them that I’ve been meaning to get to for awhile. 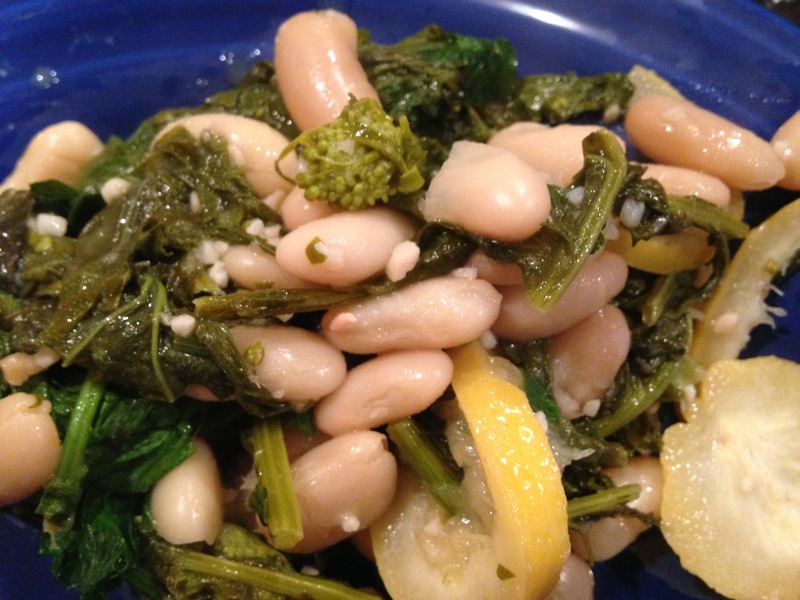 This time I took a stab at White Beans with Broccoli Rabe and Lemon from Bon Appetit. It sounded interesting because you actually eat the lemon. Had to try it. 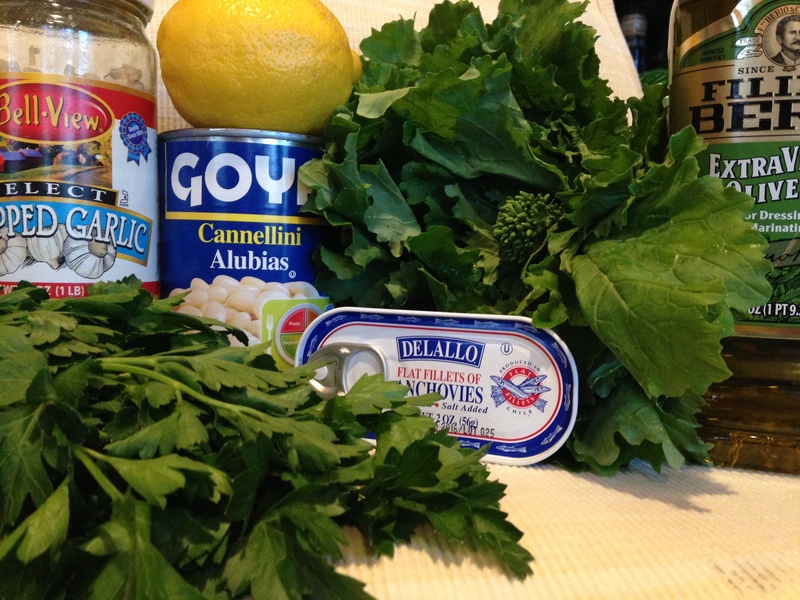 -Ok, the first fun part of this was getting the broccoli rabe at the store. It was mixed in with every other one of the leafiest, darkest greens possible. 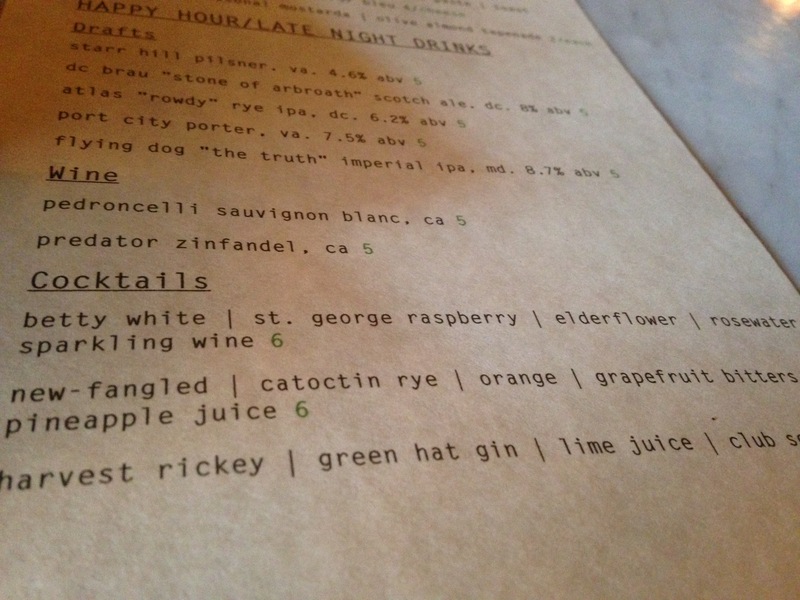 It was also labeled by its non-normal name — rapini. Why must they have done this to me? I was about to fold and just use broccoli. -Heat oil in a large Dutch oven or heavy pot over medium heat. Add lemon, anchovies, and garlic. Cook, stirring occasionally, until lemon is softened and brown in spots and anchovies fall apart, about 5 minutes. Add broccoli rabe; season with salt and pepper and cook, tossing occasionally, until bright green and crisp-tender, about 5 minutes. -Add beans and ½ cup water to pot. Bring to a boil; reduce heat and simmer, stirring occasionally, until flavors have melded and liquid is reduced by half (you still want it to be saucy), about 5 minutes. In the middle of making it, I decided there was not nearly enough broccoli rabe in there, so added a ton more (that’s why below some stuff is bright green, some is less so). Mix in parsley and 2 Tbsp. Parmesan. -Transfer to a platter, sprinkle with red pepper flakes, if desired, and top with more Parmesan. This was quite good. The lemon was nice and soft and gave good zing to the dish. Definitely keeping the recipe. Was flipping through a (sort of) recent Bon Appetit issue the other day (January 2015) and came across a recipe that looked tempting. With the ‘warm’ weather — I’m talking upper 50s and sunny after 8″ of snow last week — it was just far too appealing. It’s essentially a no-cook recipe, which was a bit off for a January recipe. Cook rice according to package directions. Spread out on a rimmed baking sheet; let cool. 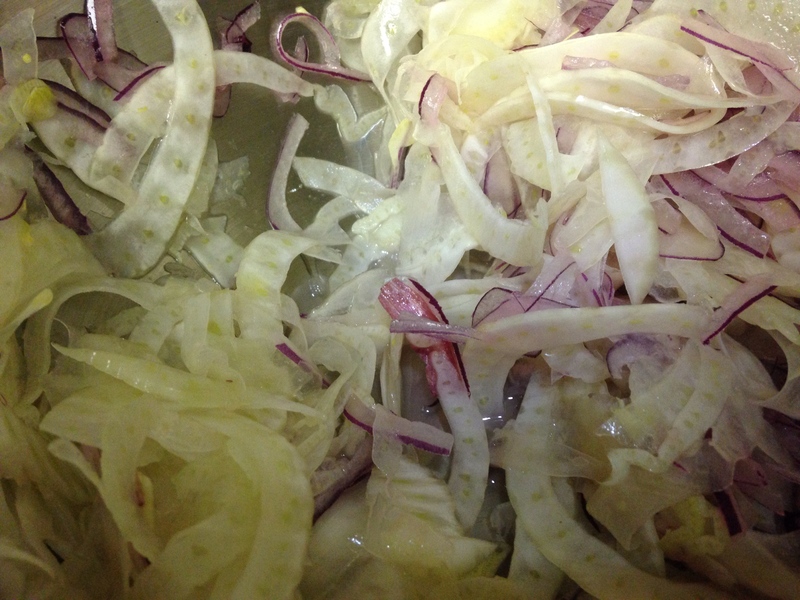 Meanwhile, toss fennel and onion with 2 tablespoons lime juice in a large bowl and let sit, tossing occasionally, until lime juice is almost entirely absorbed, 10-15 minutes. So at this point, since it had to be thinly sliced, it was time to pull out the V-slicer/mandolin. Had such a great time! Coarsely chop 1/3 cup pecans; finely chop remaining nuts. Laziness here, bought them that way — and, a heck of a lot cheaper for some reason. Cook in olive oil in a small saucepan over medium-low until golden brown, 5-10 minutes. Let cool. 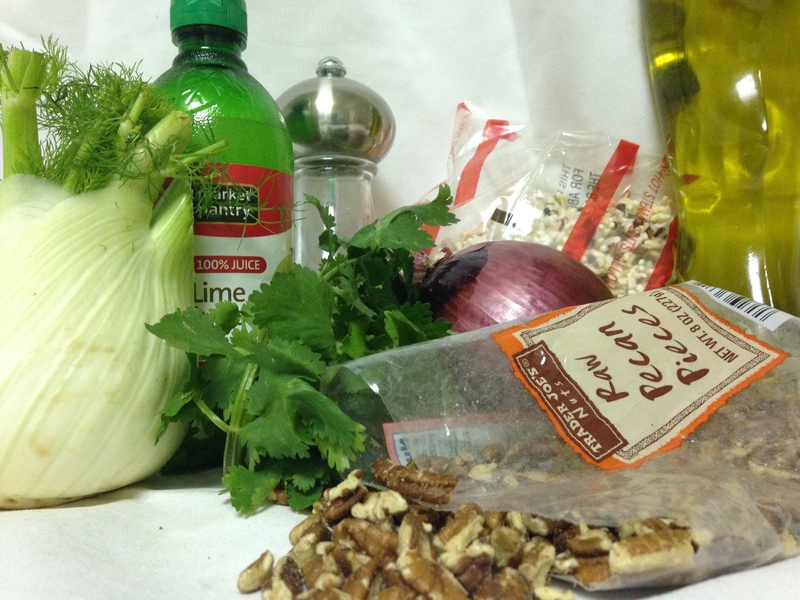 Add rice and pecans to fennel mixture along with remaining 1 tablespoon lime juice and toss to combine. Gently fold in cilantro; season with salt and pepper. Serve drizzled with pistachio oil, if desired. 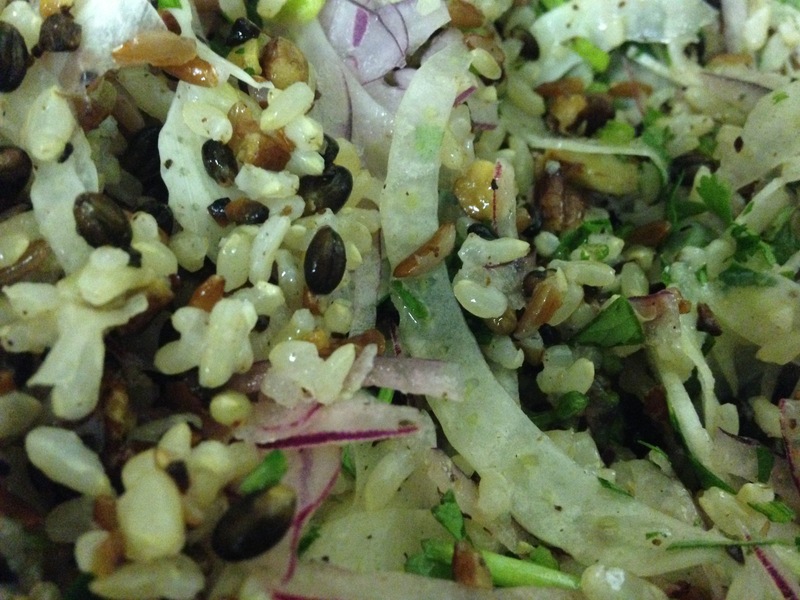 *Do ahead: Rice salad (without cilantro) can be chilled up to 1 day. Bring to room temperature before serving. This salad was mouthwatering. I did not expect it to be this good. Wow. It could also easily be made with quinoa and/or another nuts. Will be a perfect summer recipe. Wow, delicious.